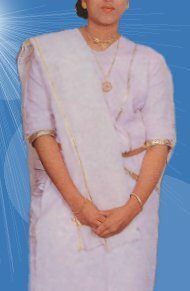 Chatta and Mundu was the traditional dress of Christian women of Kerala. Full blouse, Kavani and Mundu with special pleats at the back constitutes a typical Chatta and Mundu set. Formerly only white colors were used and later small embroidary and flowers started seen on Kavani. Even though today's generation does not wear it, Chatta and Mundu is still seen worn by their grandmothers.